“Boy” (2010) is a rather eclectic comedy set in native Maori culture of New Zealand. The “boy”, 11 (James Rolleston), has become a devout Michael Jackson fan and worships his father (director Taika Waititi) whom he imagines achieving stardom in the pop world. Instead, his father has returned to look for a bag of money (reminding one of the Russian film “The Return”) and has failed as a small-time gangster. Lives are simple in this film and seem to have little connection to the rest of the world, although there are glimpses, like of a bicycle road race. There is also a pet goat, and a younger brother Rocky (Te Aho-Eketone-Whitu). The official site (Kino Lorber) is here. I can remember, when I was about seven, having a fantastical idea about my own father, making up a test for him to fill out, which he mailed back to me special delivery on a Sunday afternoon. The English is often hard to decipher and the Maori does not have subtitles. There’s a nice dance ensemble (like Slumdog’s) at the end. The film placed well at Sundance, Berlin and AFI festivals in 2010. I've met only one native Maori, half, that I can recall, on an Adventuring hike in the 1990's. 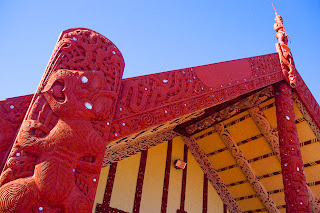 Wikipedia attribution link for Maori meeting house.